In 1992 the term “You’ve Got Mail” may have been the most appealing noise your computer could make. It was all fun. Email Marketing wasn’t even on the radar. Matter of fact, the term “You’ve Got Mail” was so well branded that they even made a movie about it in 1998 –You’ve Got Mail with Tom Hanks and Meg Ryan. 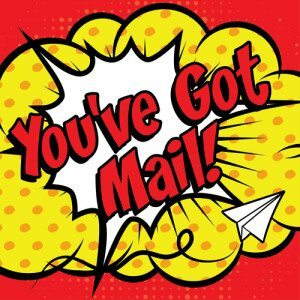 Maybe it was the movie or maybe it was the 10 gazillion pieces of email spam that have hit inboxes around the world since…but the term, “You’ve Got Mail” has since lost its unopened-present-sitting-in-front-of-you reaction nowadays. Nope, today email boxes are filled with messages about work, family, offers for discount Viagra, and the occasional notice of winning the multi-million dollar lottery in some far off country you never heard of. But email marketing is STILL a friggin’ goldmine! Despite the apparent email burn out, email marketing can be a big boost for your company…if done right. Before I get into some strategies and tactics that work great when email marketing, let’s go over a couple rules about email marketing. Rule #1 – Only send emails to people that have asked to receive them. Don’t be a @%&!. Don’t be a spammer. Aside from the fact that you will, at some point, get cut off from your Internet provider, people will just not like you. And if they don’t like you, they won’t do business with you. Period. So, only send emails to those that want them from you. That means the person has given his or her consent. I often speak about ‘Double Opt-in’; where the person had to “confirm” that they wanted to receive your emails. That keeps you list pretty well bullet proof – everyone wants your email (at least for now). Rule #2 – Don’t send out too many emails. Every once in awhile I get on a list where someone feels the need to send out emails too frequently. They are usually people that get some sort of “sale” off the email. I guess they figure if they send out more and more, they will get more money. In reality, they get people opting out of their list. Don’t get me wrong…they may get more money in the beginning…just by beating people up. But what is the LONG TERM value of a customer? That is what you want. Unless I signed up for a DAILY horoscope or DAILY stock notification, I don’t want emails on a daily basis from anyone. *Sometimes twice if you have something super cool to tell me that couldn’t wait until next week. Don’t send information that is not relevant to the list (the reason they signed up in the first place). For example, if I have built a list out of people that love cats, I am not going to send them an offer on dog supplies. They are cat people. They didn’t sign up for info on dogs, parrots, discount sporting goods, or saving money on car insurance. Give them what they want…cat stuff. Somebody has an email list full of a particular niche and then they send something completely irrelevant. Again, just leads to confusion and people opting out of your list. Rule #4 – Don’t only sell. Even if someone signs up for your email marketing, you need to always provide value. If all you ever do is ask for money or try and sell something, people will stop opening your emails and….you guessed it….opt-out. Personally, I like to see 4-5 emails going out that contain content (no sales pitch) per one (1) sales email. Let’s just say you email your database a recipe on how to make a certain cupcake. How many people are going to go through all the trouble of making the cupcake versus how many people are going to just come in and buy the cupcake (since now they are thinking about it)? You would be surprised how the more information and content you share, the more you sell. Totally counter-intuitive…but it works! AND…wondering what email service to use? Check out my review of the Top Email Marketing Services.